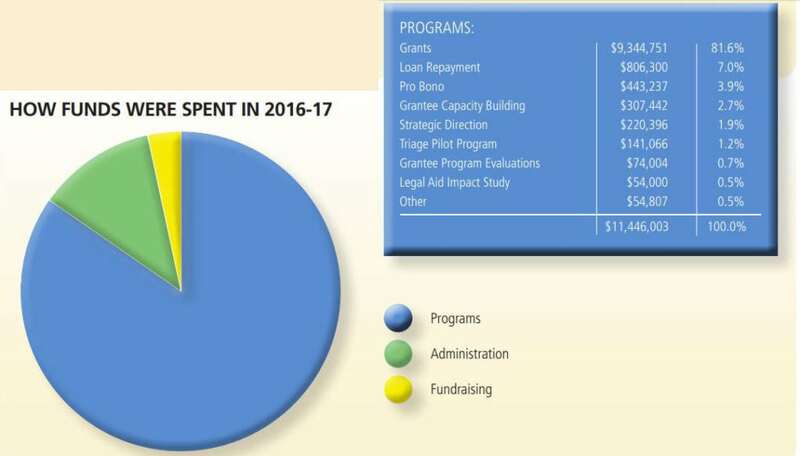 In 2016-17, the Foundation spent more than 84% of its total expenses on charitable activities. Management and general and fundraising expenses represented 15.3% of the Foundation’s total expenses. Of the $11,446,003 in grants and related activities, $10,573,003 was expended on Legal Assistance for the Poor and $873,000 on Improvements in the Administration of Justice grants. * The consolidated financial statements are presented for convenience and information purposes only and should not be relied upon. A copy of the printed consolidated financial statements will be provided upon request. With the advent of the global recession, the U.S. Federal Reserve instituted a monetary policy that has held the Federal funds rate near zero for several years. This has had a devastating impact on revenue from Florida’s Interest on Trust Accounts Program, The Florida Bar Foundation’s primary source of revenue. 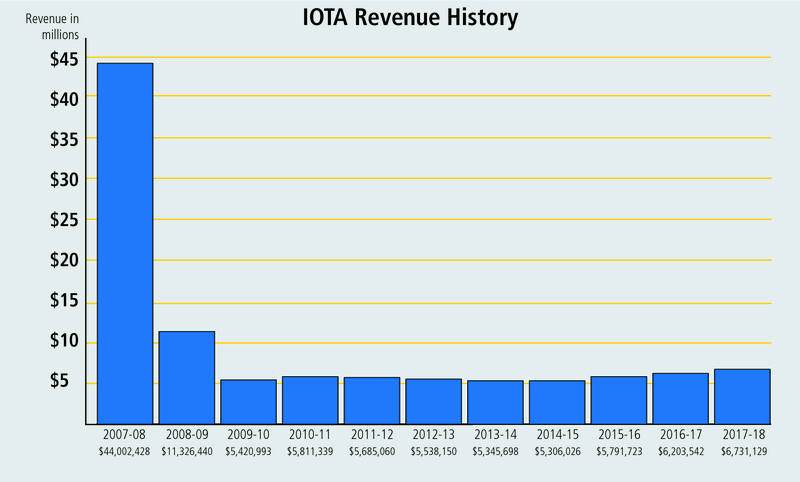 This chart shows IOTA revenue in millions since the 2007-08 fiscal year. Foundation funds are invested by professional investment managers under policies approved by the board of directors. The investment policies are developed with assistance from outside consultants who also work with the Foundation’s investment committee and board to evaluate investment managers’ performance. September 1981 marked implementation by the Florida Supreme Court of the country’s first IOTA Program and the beginning of an important source of support for civil legal assistance to the poor– projects to improve Florida’s justice system and programs to promote public service by law students. While we often mark that milestone and thank those responsible, we don’t publicly recognize often enough Florida’s banking community. 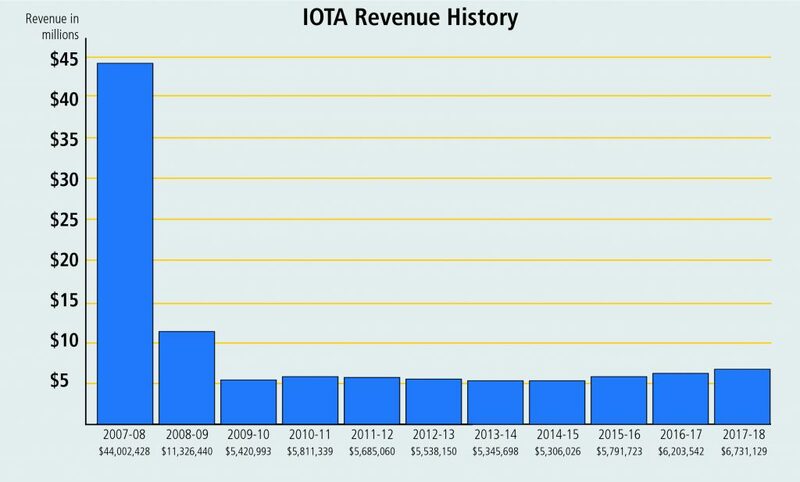 IOTA works because of the support and cooperation of Florida banks, from the superb bank staff who make sure monthly remittance information and interest gets to the Foundation, to the teams who worked so closely with the Foundation to implement the interest rate comparability rule, to the leaders of the Florida Bankers Association who step up to the plate and help IOTA achieve its full potential. The Foundation, its grantees and those they serve are very grateful for the successful partnership between the legal and banking communities that is Florida’s IOTA Program.